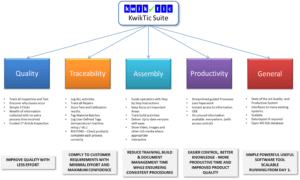 KwikTic – Keep it Simple! 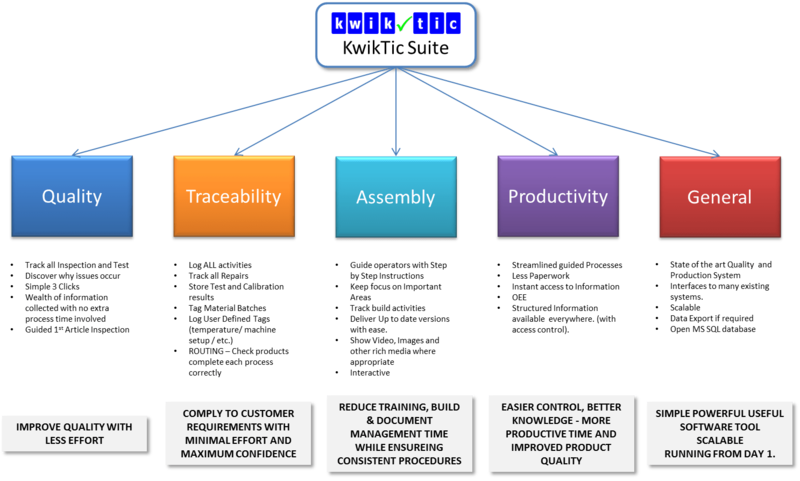 KwikTic is a scaleable Suite of MES tools to help you control your shopfloor easier. There are probably areas in your operations which would benefit from a 'tune up', so you can work smarter and more efficiently across the board. Guide your operators through every step of the process. Giving them detailed information at the click of a button when they need it. Keep track of all production with clear reporting and dashboards. Live and up to date. At the click of a button. We provide shopfloor MES (Manufacturing Execution Software) to help make your life simpler, both delivering the correct up to date information on production orders and products and collecting information about each manufacturing process. Call it Industry 4.0 or Smart Factory if you like. What do you know about your shopfloor? How do you provide instructions and production orders? Is it possible there are costs involved in this? Would you like to improve quality? What would an increase in productivity mean to you? Do you need to document Processes or provide Traceability data? KwikTic can make your life easier. All data is collected and stored in a single Central SQL Database (onsite or in the cloud) – meaning everyone has access to up to date information and reports: only a couple of clicks away. KwikTic is scalable, so implementation is cost effective, manageable and you’re able to grow at your own pace. No 2 assembly companies are the same. Requirements differ based on complexity of processes, products, resources, size, etc. KwikTic users range in size from small companies (5 persons) up to large multinationals. You decide which features are going to give you the fastest return and how wide spread you want to implement them. … then please call or email us. We’d love to demonstrate how easy it is to implement and how powerful KwikTic could be to you. It’s simple – you could be up and running in hours. But yet, we cover a whole lot of functionality.